Apart from the more obvious reading of a recipe, cooking and reading arenʼt necessarily two things that youʼd normally think to put in the same category. However, I believe there arenʼt many things more closely aligned than these two activities. What has the power to transport you to another time or place without ever leaving the comforts of your own home, a good book and a good meal. What can bring people of different ages, nationalities, and religions together, a good book and a good meal. What can simultaneously invoke the feeling of love and also despair, coming to the last page of a great book, and realizing that youʼve taken the last bite of a great meal. When your childhood best friend is Puerto Rican, there are a few things that you learn pretty early on in life, the love of food, music, and that nobodyʼs cooking holds a candle to Momʼs cooking! I know beyond a shadow of a doubt that my love of cooking stems from those endless nights sitting on the stools at the bar of my best friend’s house, chatting away & watching while “Mom” was throwing down in the kitchen. As an adult now myself, I can say that there are few other things in life that bring me more joy than cooking and feeding those whom I love. As most of you can probably relate, I may have a slight Outlander obsession. Whatʼs not to love, a handsome, drool worthy 18th century Scottish warrior, men in kilts, time travel, passion, romance, history, and did I mention men in kilts! Needless to say, I was shamelessly hooked at the first sight of James Alexander Malcolm Mackenzie Fraser. I came to the books through the show and almost instantly became enthralled with the love story between Jamie & Claire. One other thing that stuck out to me, beyond the obvious, was how much of the story was centered around food. The gatherings, the family reunions, the celebrations, the banquets, Mrs. Fitz and her bannocks, the wine, whisky, and Rhenish. Food and drink were consistently present throughout the entire story. As I stated above, food has a way of bringing people together, a fact that wasnʼt lost on these 17th century characters. Theresa is currently working on Outlander Kitchen 2! Luckily for me, a woman by the name of Theresa Carle-Sanders decided to come out with a cookbook called Outlander Kitchen Cookbook: The Official Outlander Companion Cookbook. Any opportunity I get to bring my love of cooking and reading together, you better believe Iʼm taking! So thatʼs what brought me here–well, more like a slightly crazy obsession with a fictional character, then a realization that Iʼm not alone in my craziness, followed by a Facebook page and blog run by the wonderful Beth Pittman actually brought me here, but yʼall get where Iʼm going with this. So here I am fellow Sassenachs, with my “Outlander Companion Cookbook”, a glass of red wine, and a spatula, getting ready to throw down an Outlander-inspired meal from start to finish, and Iʼm bringing yʼall along for the ride. First up on this journey for the taste buds is “Murtaghʼs Gift to Ellen,” or Puff Pastry Boar Tusks. Asparagus and puff pastry and bacon…..oh my! The cookbook does have a recipe for a Blitz Puff Pastry, however I chose the easier route & visited the freezer section of the local grocery store for some Pepperidge Farm Puff Pastry Sheets. Before you get all “Thatʼs not how they did it in the 18th century,” just know that the cookbook does offer that as an option in the recipe, and that was one modern adjustment I was definitely going to take! The construction of this adorable appetizer was quite simple & easy enough to do, yet looks as though great detail went into the prepping/cooking process. Would I make this again? With one minor adjustment, aye, I most definitely would. As for that adjustment I mentioned, Iʼd probably opt to coat the puff pastry part with a melted garlic herb butter once removed from the oven. That would take it from being a cute & tasty appetizer to a cute and delectable appetizer thatʼd impress anyone youʼd serve it to. Letʼs talk sides. When youʼre slaving away over a meal of this magnitude, keeping it simple yet delicious is key, and boy did I unlock a couple of winners! I went for the “Broccoli Salad,” (p. 210), and the “Matchstick Cold-Oil Fries.” I have been making homemade fries for the past 10 years, and now I know that for the past 10 years, I have been doing them totally WRONG! Who wouldʼve thought that the trick to getting the most crispy and delicious homemade fries youʼve ever had, was to start off with cold oil? Certainly not me, but I can guarantee that I will never make fries using any other method again. Iʼm here to tell you that the cost of this cookbook is well worth it for this recipe alone! My only regret is that I didnʼt make more! Now, not to take any shine away from those seriously insane french fries, but the broccoli salad was pretty darn amazing in itself. Fresh, crunchy, tangy, with just a hint of sweetness, and did I mention bacon? Yes people, more bacon. Letʼs be honest, can you ever go wrong with a recipe that has crunchy bacon as an ingredient? The answer to that question, is absolutely not & this recipe was no exception. There isnʼt a single thing that I would change about this salad. So just to recap……yes, yes, and more yes when it comes to these two sides! Moving right along, we come to the main entree, “Sweet Tea-Brined Fried Chicken,” (p.112). Now, I love a glass of sweet tea just as much as the next person, but I canʼt say that Iʼve ever imagined using it to brine chicken, or anything for that matter. Once I got beyond the initial “Huh?” phase, I was ready to jump right in. You start off by brining the chicken for a few hours in a homemade sweet tea concoction, filled with what else other than a ton of sugar. Yes, there are a few other ingredients, but youʼll have to buy the book to figure those out. Believe me when I tell you, I not only wanted to like this recipe, but I really wanted to love it, unfortunately that wasnʼt necessarily the case. Donʼt get me wrong, the chicken was outrageously juicy and tender, accompanied with a perfectly crisp outer coating, what lost me was the sweetness. Not overpowering, but enough to make the dish just “okay”. The crispness of the coating was spot on though, Iʼd only say it needed a little salt to make it fried chicken perfection. The recipe wasnʼt a total loss for me though, Iʼd definitely use that coating again, and like the idea of brining beforehand, however Iʼd personally stick with just a good ol’ salt water brine. Last but certainly not least, I bring you the “Warm Almond Pastry with Father Anselm,” (p. 255) for dessert. Thereʼs really not much I can say about this dessert other than delicious! If you like a dessert that isnʼt overly sweet, then this is the dessert for you! Itʼs light and flaky, and would go perfect with a nice cup of hot coffee. I will for sure be making this again in the very near future. I hope youʼve enjoyed the ramblings of this food obsessed Sassenach. If you donʼt already own this cookbook, do yourselves a favor & go buy it ASAP. If the last thing you need is another cookbook lying around taking up space, then visit your local library, check it out and take pics of the recipes that interest you. You wonʼt regret it! This has been quite the tasty experience, but now itʼs time for me to summon my children and have them roll me into bed. Good night yʼall. Harmony was born and raised in Ft. Lauderdale, FL, but found her forever home in the mountains of North Carolina in 2017. She is married to her “Jamie” and the mom of two boys whom she homeschools. Harmony discovered Outlander while Season 2 was showing on Starz, and instantly fell in love with Jamie and Claire’s love story. In her spare time, she enjoys being with her family and getting outside to explore their new home in the mountains. Harmony is a moderator for the Outlander North Carolina Facebook Group, and hosted “Happy Hour with Harmony” on Saturday evenings, using recipes from the Outlander Kitchen cookbook to make cocktails and mocktails. If you’d like to see the videos, join the Outlander North Carolina group on Facebook, and go to our Videos section–Harmony is a great hostess! Do you have a copy of Outlander Kitchen, or have you been a follower of Outlander Kitchen website before there was a cookbook? What’s your favorite recipe? My previous article that focused on the beginnings of formal government in the Colonial town of Edenton, North Carolina, was an easy post to get together. But Edenton is so rich in history, that honing in on one subject to write about next was kind of difficult for me. I wanted a piece that had some correlation with Claire Fraser–she is our heroine, after all! I was looking through photos of Edenton, and I kept seeing the lovely Penelope Barker House at the Edenton waterfront, because it’s always a popular choice for photographers and visitors. Then it hit me: Penelope Barker was one of the strong–and probably feisty–women of the Revolutionary period in Edenton, just like Claire! She may not have been a time-traveling healer who settled in the wilds of the North Carolina highlands, but she had a toughness that only a woman who had experienced hardship can have, and plenty of influence, because she was a woman of genteel birth. We’ve all learned about the Boston Tea Party, and how Bostonians were sick and tired of taxation without representation, and how they dumped tea (not ice-cold, sweet tea, but the leaves that make tea! ), into the Boston Harbor in protest to King George’s demands. Well, Penelope Paggett Barker, who, before the age of seventeen was an orphan, ran the family plantation while raising her dead sister’s children, was widowed twice before age 20 with boys of her own, and the richest woman in the state of North Carolina, (she married up, y’all), decided that she would organize a little tea rebellion of the Southern kind. Penelope’s third husband, Thomas Barker, sailed to England in 1761 as an agent of the Crown for North Carolina, and because of her personal history, was confident that Penelope would be able to handle all of their affairs while he was away. Thomas was stranded in London, thanks to the blockade of American ships, and was away for seventeen years! During his time abroad, the Revolution was in high gear, and soon, Patriot leaders were encouraging the Colonists to rebel against the ridiculous taxes when Parliament passed the “intolerable acts” after the Boston rebellion. Leaders encouraged the women of the Colonies to boycott cloth and tea from Britain, both of which were mainstays of life in the 18th century. So, Penelope Barker took action. About fifty women signed the resolution, and held their tea party at the home of Elizabeth King on October 25, 1774, enjoying tea made of mulberry leaves and other local herbs. The first political women’s protest in the country took place in little ol’ Edenton, North Carolina. But that wasn’t the end of it. Penelope reportedly sent a copy of the resolution to London, and it was published in newspapers and magazines by early 1775. While the resolution was celebrated in the Colony, the British were shocked, and a popular cartoon was soon making the rounds that caricatured the women as promiscuous and not taking care of their children! (See a photo of the actual cartoon below.) The leaders were appalled that women would dare protest so publicly, and one man, Loyalist Arthur Iredell, wrote to his brother, James in Edenton, and asked him if there was a Woman’s Congress in Edenton as well, and sarcastically said that those loyal to the British Crown had plenty to worry about with women fighting for the Patriots. What a jerk. Women of the Colonies were resourceful and found plenty of local substitutes for products they were not using from England. The local teas that Colonists continued to brew during this period of rebellion caught on, and there was even one blend that was dubbed “Liberty Tea,” reportedly made up of red rose petals, linden blossoms, elder, red clover, violets and goldenrod, according to the Women History Blog. To commemorate these courageous women, there is a 250-pound bronze teapot statue atop a Revolutionary War Cannon near where Elizabeth King’s home once stood. It was placed there in 1905 by farmer Frank Wood, who lived at Hayes Plantation where Penelope is buried. Wood commissioned foundry man Frank Baldwin of Watertown, Connecticut to create the memorial using a silver teapot once owned by a former North Carolina governor Samuel Johnston as a model. I know the Edenton Tea Party time has passed by the time of the setting of ABOSAA, but maybe, just maybe, Diana Gabaldon decides in BEES, (book nine, currently being written), that Claire needs to meet the remarkable Penelope Barker. These two remarkable women could get a lot accomplished if they were to put their heads together! So, while you’re enjoying a glass of ice cold tea–with sugar, if you’re Southern–think about the women who stood up for themselves and their hopes for independence, who foraged for leaves and flowers that they had to pick, dry, and store just to have a nice cup of tea. Raise your glass to Penelope Barker, strong, courageous leader of Edenton, North Carolina. The Penelope Barker House, which serves as the Welcome Center for Edenton and Chowan County, is located at the waterfront end of Broad Street in Edenton. It’s a beautiful three-story house that used to sit a few blocks north when Penelope and her family lived in it. If you’re visiting Edenton, stop in at the Barker House, where you’ll learn about the Historic Walking Tour, and other historic facts and places about the town. For hours and directions, visit http://ehcnc.org/places-of-interest/the-barker-house/ . For even more information, check out these links: Visit Edenton and Historic Edenton. Have you ever visited Edenton or heard of Penelope Barker, the Edenton Tea Party and their place in Revolutionary War history? What about Penelope reminds you of Claire? Susan Jackson is a mother of four who lives in coastal North Carolina, and is an avid Outlander fan. Besides reading, she loves cooking and baking, and music. She is a thyroid cancer survivor and has worked in education most of her life. She hopes to one day blog about her thyroid cancer journey. She is a contributing author for Outlander North Carolina and, among other articles, has previously written about the infamous Stede Bonnet in Will The Real Stephen Bonnet Please Stand Up? Have You Joined Our Facebook Group? No? Click Here To Join! NC residency is not required! His breath was gone and he breathed again, taking mine. His hands were linked behind my head, holding me, face-to-face. “If I am to live as a man, I must have a mountain,” he said simply. His eyes were open wide, searching mine for understanding. “Will ye trust me, Sassenach?” he said. His nose pressed against mine, but his eyes didn’t blink. Neither did mine. “With my life,” I said. I felt his lips smile, an inch from mine. “Always,” I whispered, closed my eyes and kissed him." A North Carolina girl, born & raised, who is terribly obsessed with all things Outlander! If you’re looking for an expert on Outlander or North Carolina, I’m far from it but I sure look forward to learning a lot on this adventure with Jamie & Claire through the Tar Heel State. Wanna come along? Cool! But, wait, before you pack your bags and sell all your belongings, you might want to click here just to see what you might be in for! 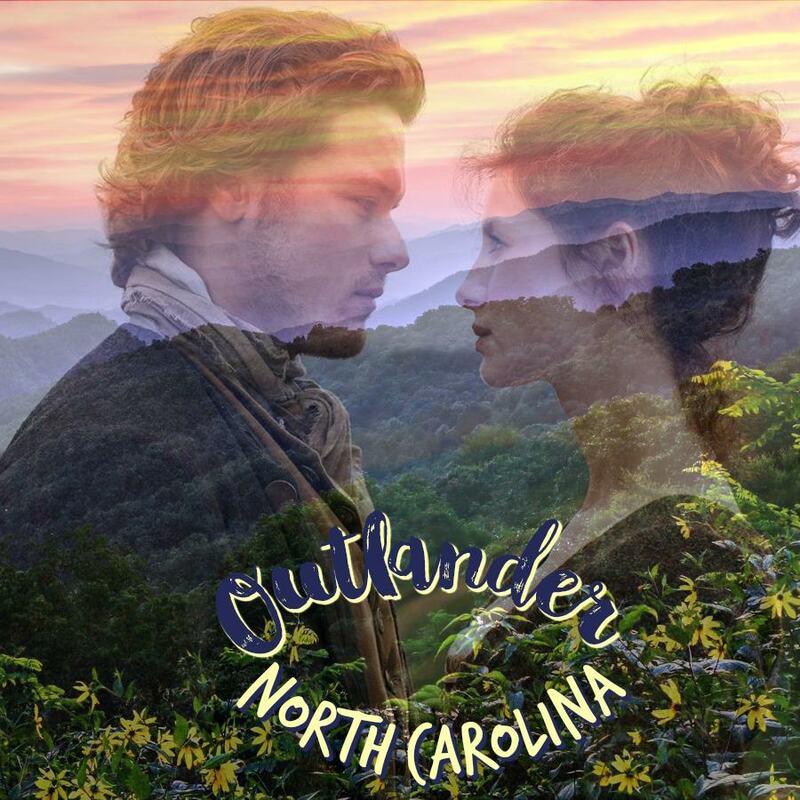 Oh, and welcome to Outlander North Carolina! This is a fan website. All quotes, characters and events from the OUTLANDER series of books are the genius of, owned and copyrighted by Diana Gabaldon. (Although I would love to own Jamie Fraser. Excuse me, I digress.) All quotes, characters and events from the Outlander series on STARZ are the property of STARZ. Therefore, it is not the intent of this site to infringe upon the genius, copyright or ownership of Diana or STARZ. As you will see, I am no genius. All opinions, thoughts, random musings, mindless ramblings and the like expressed on this site are very much my own which should probably scare you but I hope you will hang around anyway. Disclaimer: This is a fan website and is in no way affiliated with OUTLANDER or the STARZ Network.